It's time for another unboxing review. Today I've got something a little different and quite special. 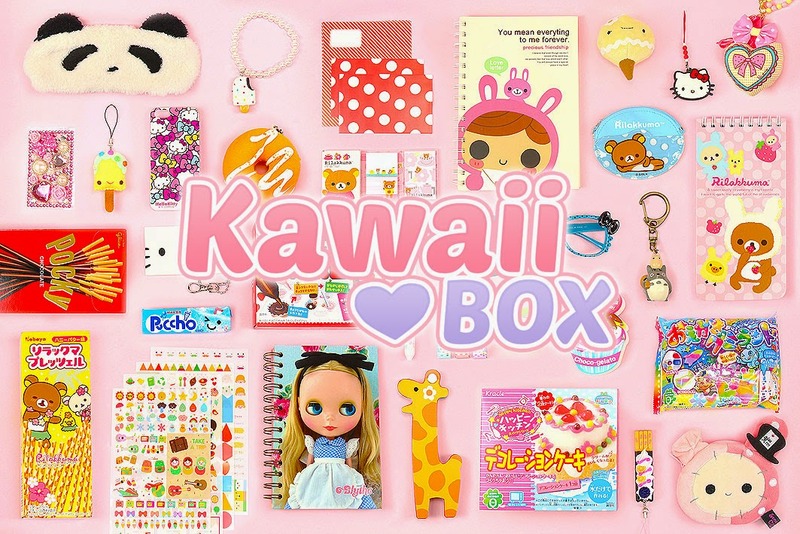 I've been sent the autumn Kawaii Box. (For those of you who haven't encountered this Japanese word, and didn't immediately reach for google translate, Kawaii means 'cute'). I've been a little slow on writing this unboxing up, mostly because of the usual family visits and the crazy increase in competitions that always happens this time of year (I cannot believe how many more advent competitions there are this year compared to last year! It's hard to keep on top of them all!). Anyway without much further ado, let's jump right in. Opening the box and removing the suitably pink tissue-paper packing reveals a collection of cute things; I wasn't entirely sure what to expect (well, I was expecting cute) but was thinking there'd be a few things that my niece would love -- although I might sneak a couple of cute things out of it for myself! (shh, don't tell her). First up we have a postcard welcoming us to the Autumn Kawaii box, quickly followed by a box of Pocky! If you've been to "nerd stores" like Forbidden Planet, you may have seen these chocolate biscuit sticks before (alternatively the "import candy" places like 'Cyber candy' etc. might have them too). Now THESE we love - a few years back there was a big push on 'Mikado' chocolate biscuit sticks - and we couldn't get enough of them - these Pocky (I think) are what the Mikado sticks are based on. Next up we have what looks like a pair of ankle socks with a cute 'hello kitty' type rabbit style character on. They're for size 23-24cm (a bit of a google converts these to a ladies size 4/5 UK). I have fairly small feet and always like cute socks so may well sneak these into my sock drawer (and onto my feet) in the very near future! We then have a roll of "Bud silk stationery stickers" - 18mm x 1m of a nice and lacy heart tape. Looking at the label I think the idea is that you use this tape to make your pens, pencils, books, desk sorters etc. look cute and a little more individual. Not something I've ever seen here in the UK before, but something that looks like it could be quite fun - and would make your otherwise "same as everyone else" stationery set look a little bit more special. There's also a cute anime/manga style cat key ring which looks really sweet. It looks like you can use it either as a key ring or a bag charm as it has both a clip to attach it to your bag and one of those rings you usually break your nails on as you try and slide your keys onto it. Next there's an incredibly cute 2015 Little Sheep Mini Calendar. I've not taken it out of the wrapper yet but it looks really cute even though it has a bit of a minimalistic design to it. It has a definite anime/manga feel to it and I will definitely put it on my desk for the coming year. We also have an XI YUAN key chain/bag charm. The one we have is a bubblegum pink OMG one. Unlike the plush cat keyring/bag charm, this only has the "break your nails putting the keys on it" ring, but I don't this really detract from it. I think this might be something my niece would get a lot more out of that I would. The box is just full of cute! Next there's a zipper bracelet. I've been told they're "in" at the moment, but I've not seen any other than this one. That said, it looks really quite cool and fun. The only thing wrong with it is that it's a bit fiddly trying to put it on one handed like a lot of bracelets are. We then have a couple of cute "little talk" post-it note style sticker blocks with the phrases "don't worry" and "dreams come true" on them. Very cute - although only a small number of them (20). I think these will be used in specific little messages to special people rather than the usual "remember to get milk" type notes that post-it style things are usually used for. There's then an awesome macaroon charm for your phone or desk or - well - where-ever you'd put it! It's very cute and I discovered after a bit of fiddling that the macaroon opens up and is a little pot that you could put something in. It would have been cool if it was a lip gloss or something similar but I guess you could use the pot to put tablets or earrings in for example. Finally - and I really love these - there's some YOOFUN Puffy Stickers. They have a big written sticker of "Have you ever seen a Panda?" and that's because if you haven't, you will now. The sheet is full of pandas in all sorts of poses and shapes and sizes. (Well, actually they're mostly the same size). They're really cute and all look to be unique for the most part, we're light on repeaters! (Only a couple of the panda heads are duplicated - which is really nice!) They seem to be arranged in a "doing things" sort of order, so you have pandas dancing, crawling, doing ballet and just having a bit of a relaxing chill time. Very nice! Although, to be honest, it almost feels a shame to take them off the sheet and use them!